Below you will find a bit about me and the work that keeps me going. I would love to hear from you with questions, comments, concerns, suggestions and the like. 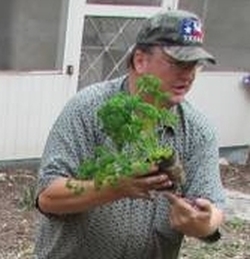 Joe Urbach is the original Kitchen Garden Farmer and has both lived and worked in the Austin, Texas area for over 30 years. In the last ten to twelve years he has concentrated his efforts on installing many raised bed and container kitchen gardens in Texas from Austin to San Antonio and all surrounding areas. He has also been teaching young and old how to maintain their kitchen gardens and how to help their kitchen gardens provide a bountiful harvest of healthy, delicious and really fun to grow (and eat) foods. While still very much the advocate for a "kitchen garden in every home" Joe now finds that his focus is set on changing the way we all think of our food - be it from our kitchen gardens, farmers markets or the local supermarket. Joe is becoming a phytonutrient gardener and wants us all to come along for the journey to better, healthier, longer and more active and productive life!